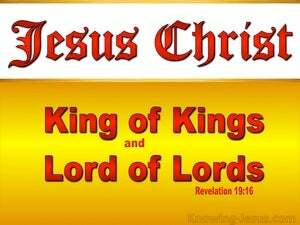 ﻿ Revelation 19:16 And on His robe and on His thigh He has a name written, "KING OF KINGS, AND LORD OF LORDS." And he has on his garment and on his thigh a name written, KING OF KINGS AND LORD OF LORDS. And he hath on his garment and on his thigh a name written, KINGS OF KINGS, AND LORD OF LORDS. 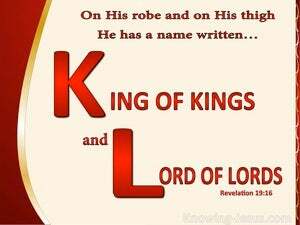 And on His garment (robe) and on His thigh He has a name (title) inscribed, king of kings and lord of lords. And on His robe and His thigh was written the name, "King of kings, and Lord of lords." And he has, on his raiment and on his thigh, a name written, King of kings, and Lord of lords. And on his robe and on his leg is a name, KING OF KINGS, AND LORD OF LORDS. And he has on his robe and on his thigh a name written, KING OF KINGS AND LORD OF LORDS. on the mantle about his thigh was this inscription, KING OF KINGS, AND LORD OF LORDS. And he has upon his garment and his thigh a name written- KING OF KINGS, AND LORD OF LORDS. On his clothing and his thigh he has this title written: King of kings and Lord of lords. And he has upon the garment and upon his thigh the name written, KING OF KINGS, AND LORD OF LORDS. And he has on his robe and on his thigh a name written, KING OF KINGS, AND LORD OF LORDS. And he has a name written on his outer garment and on his thigh: "King of kings and Lord of lords." And He has on His garment, and on His thigh a name written, KING OF KINGS AND LORD OF LORDS. And hath on his vesture and on his thigh, a name written, "King of Kings, and Lord of lords." And on his robe, upon his thigh, his name is written, KING OF KINGS AND LORD OF LORDS. He has a name written on his clothing and on his thigh: "King of kings and Lord of lords." He has on his garment and on his thigh a name written, "King of kings, and Lord of lords." And he hath on his garment and on his thigh a name written: KING OF KINGS, AND LORD OF LORDS. And he has on the mantle and on the thigh his name written, King of kings and Lord of lords. And he hath, upon his mantle and upon his thigh, a name, written - King of kings, and Lord of lords. And he hath upon his vesture and upon his thigh this name written, king of kings, and lord of lords. And on His outer garment and on His thigh He has a name written, KING OF KINGS AND LORD OF LORDS. 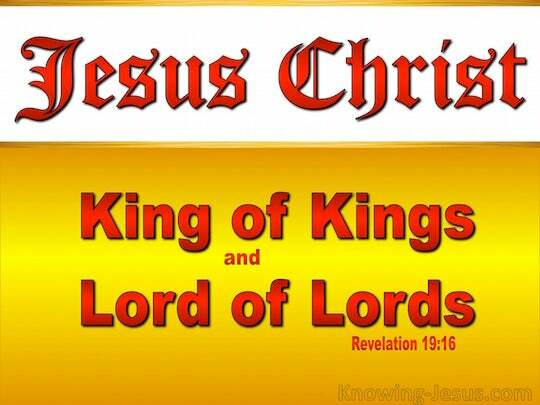 On His garment and on His thigh He has this title written: King of kings and Lord of lords. 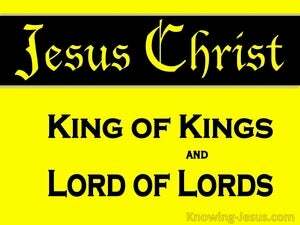 And He hath on His garment, and on His thigh, a name written, "KING OF KINGS, AND LORD OF LORDS."